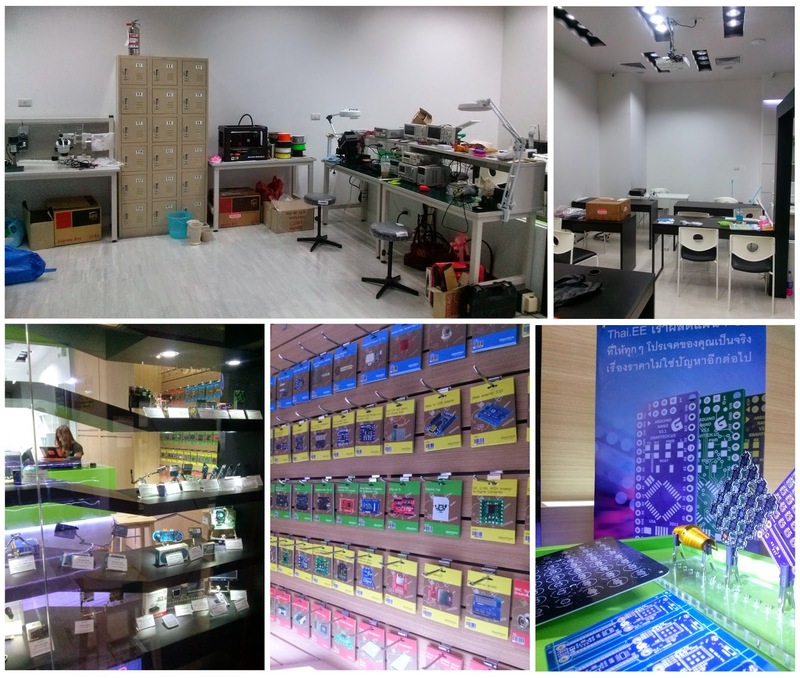 December 17, 2014 Fortune IT Mall on Bangkok's Ratchada Road has long been a place to go and buy technology but now, with the addition of a new makerspace on the 4th floor, it may become a place where regular people can make technology as well. 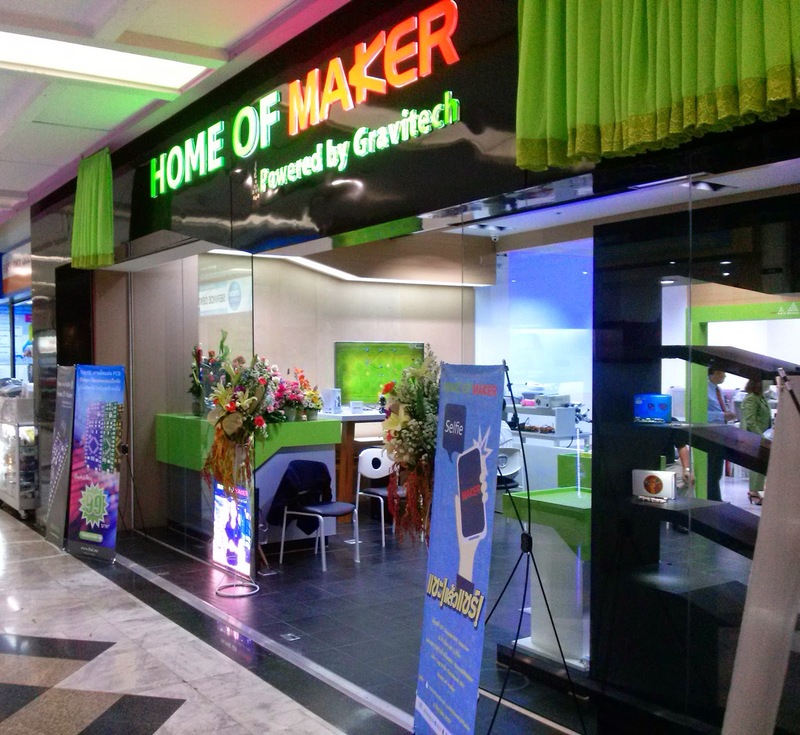 Gravitech's Home of Maker opened just this month. 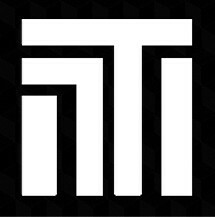 Still in the process of setting some things up, it is otherwise ready for business. Prospective makers can find it located beside the Amorn Electronics shop. Home of Maker features a storefront, a makerspace, and a classroom. The storefront includes shelves stocked with development boards, shields and components you would normally have to order online and have shipped to you. There is also a PCB fabrication service offered by Gravitech for once your prototype has been finalized and a short-run production is ready to begin. The makerspace features bench space and lockers for members, a MakerBot Replicator 2 3D printer, a drill press, a microscope and several oscilliscopes. Across from that is the classroom complete with an overhead projector for giving presentations. There, Gravitech will hold its own classes, workshops and events, but the space is also available for members to conduct their own gatherings. From top left, clockwise :: The makerspace, the classroom, Gravitech's PCB fabrication service display, developer boards and accessories available for sale, the front display window. One of the first courses to be held there at Fortune will be an Arduino introductory class. The fee includes an Arduino Nano developer's kit which will be used to create an LED lamp. While building the project, participants will learn the basics of not only using an Arduino microcontroller, but how to build a working project in the process. Left to right, top to bottom :: Microscope, MakerBot, electronics bench. Home of Maker is open everyday at Fortune IT Mall, which can be reached by Bangkok's MRT subway system via Phra Ram 9 station. Memberships are available in a wide variety offering different benefits and levels of access to the makerspace. The 3D printer is available for use with rates for members running at 2 baht per minute. What Can Makerspaces Do For Thailand? A makerspace is a place you can go to not only simply make things, but more importantly connect with other people from across many other disciplines in design, engineering and fabrication. Those running makerspaces generally invest in high-tech manufacturing systems and tools for use by many members, things each individual member might otherwise find out of their price range. The varieties of tools and talent that gather around makerspaces across the globe have created communities that not only a constructive hobby for members, but have also created sustainable small businesses and even solutions to local problems. It is the most tangible form self-driven local development one can think of with final results one can literally hold in their hands. 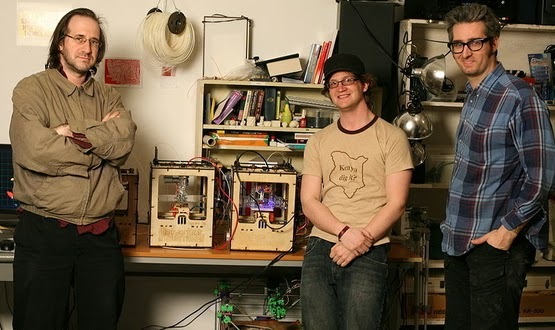 The original developers behind MakerBot at NYC Resistor makerspace. One example of this potential can be found in Gravitech's Home of Maker, their MakerBot 3D printer. MakerBot is now a well established name among 3D printing, but the company actually got its start in a New York City-based makerspace called NYC Resistor. The ability to collaborate and create in a high-tech, well connected environment means the only limitation to what can result is our own imagination. Makerspaces serve as centers of creativity, education, and local progress. Home of Maker joins Maker Zoo (located near BTS station Ekkamai) in a growing community of tech savvy makers in Bangkok, Thailand. 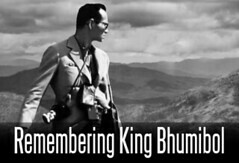 Hopefully from here, a larger, sustainable movement of pragmatic problem-solvers, makers and designers will take root. What will come out of such spaces remains to be seen, but ultimately it depends on the talent, imagination and creativity of its members. If you are in the area, stop by at Fortune IT Mall, 4th floor, and talk with the staff who are both knowledgeable and friendly.